Over the years MW Enterprises has designed and produced a variety of test fixtures (sometimes called test jigs) that are used to ensure that products perform within certain parameters. Typically these fixtures are deployed in the manufacturing facility and used to test freshly manufactured products. However fixtures are also used to test units that have been repaired or serviced, or to reconfigure units that require a firmware upgrade. 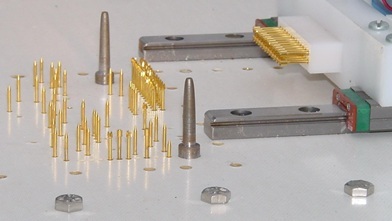 The image above shows part of the probe field for a test fixture. The circuit board to be tested is guided down onto the probes which make electrical contact with key nodes of the circuit. To the right of the picture are probes that are driven, using a pneumatic actuator, into a connector. The capital cost of the test equipment is recovered by reducing the costs of field failures, product recalls and customer dissatisfaction. Over the years we have produced quite a few test fixtures ranging from very simple units with basic testing of just a handful of parameters through to much more complex units that test dozens of parameters, download firmware to the memory ICs of the device being tested, and store the test results on a networked file-server ready for the quality assurance staff to perform statistical analysis. Many of the text fixtures that we have produced have been used to test telematics sub systems that are then installed as original equipment by leading car manufacturers. In addition to manufacturing custom test equipment, we also do general electronic design work and embedded firmware. If any of these services interest you, please get in touch for a friendly, and no obligation, discussion of how we might work together to achieve your goals.